Originally published in 1961, this study of the indigenous system of government in Ruanda-Urundi until the beginning of the 20th century, describes the complex relationship between the Tutsi and the Hutu and shows how the Tutsi succeeded in maintaining their political dominance without endangering the unity and efficient working of Ruanda society. 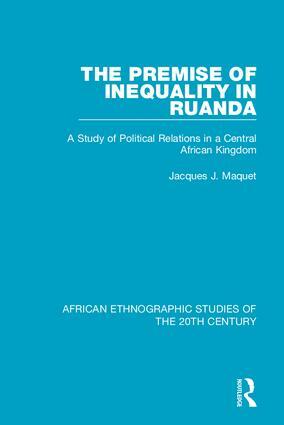 It analyses the political organization of Ruanda and the position of the Tutsi, prior to the civil war of the 1990s. Professor Jacques Maquet taught at UCLA, Department of Anthropology, from 1971 through the 1990s. Routledge is delighted to be re-issuing 79 volumes originally published between 1931 and 1988 in association with the International African Institute. Unavailable outside a few key libraries, many of these republished volumes were at the cutting edge of a fieldwork and ethnographic revolution in African anthropology in the decades after 1930. It involved the production of a wide body of fieldwork-based ethnographic documentation about the cultures of the different societies in Africa. Secondly, it saw a methodological turn to intense, localized investigations of cultural tradition and social change in a rapidly modernizing context. These investigations involved a more sustained and systematic, more professional and ‘scientific’ form of immersion and participant observation, than anything that had gone before. The sites of engagement were urban as well as rural; the pioneering researchers were female as well as male. No longer was the journal essay the repository of the latest research in the discipline, but rich ethnographies running into hundreds of pages. The volumes are supplemented with maps, which will be available to view on https://www.routledge.com/ or available as pdfs from the publishers.